The BillyOh Interlocking Windowless Shed Range gives you the choice of having a stronger and even more durable garden building, made from interlocking log cabin boards. This garden building is built to last, giving you a more solid and secure building. The 19mm interlocking boards give your items the weather protection they need to keep them in their best condition. The Interlocking Windowless Shed Range is an entry level log cabin, designed with garden storage in mind, so if you are looking for a premium garden building with storage in mind, the BillyOh Interlocking Windowless Shed Range is the perfect choice. The Interlocking Windowless Shed Range is constructed from 19mm interlocking tongue and groove boards and has a windowless design and a full boarded single or double doors for added privacy. The building is also under 2.5m in height which means you won’t have to apply for planning permission. However, before you purchase a cabin with us we do recommend that you get in touch with your local council for more information on building restrictions and regulations in your borough. Keeping your outdoor items in their best condition is important and also saves you money in the long run. With the 19mm wall thickness this building provides, it is suitable for those more important items you want to store, hidden away from sight. The tall single door also gives you good access to your items, making the building private and convenient. With its high eaves and ridge height, this log cabin also makes an excellent workspace. 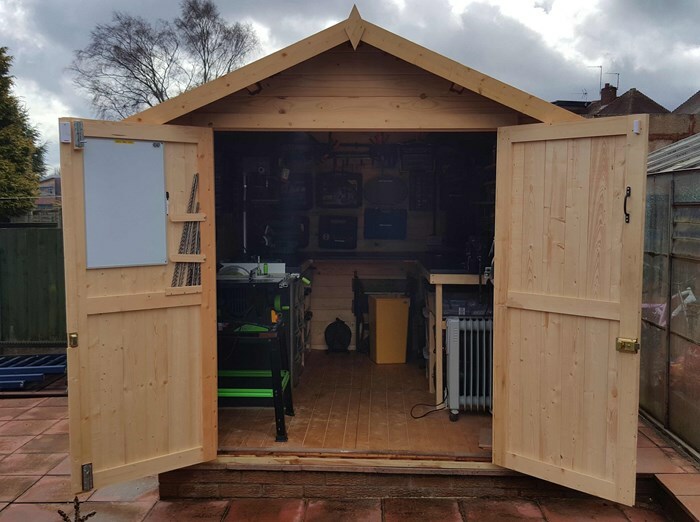 The BillyOh Interlocking Windowless Shed Range is constructed from Interlocking Tongue and Groove Boards, giving superior strength over any panel building. The wall boards lock together, keeping the elements out and your outdoor items well protected from the elements. Great for sheds wanting heavy duty storage. Boards are planed and machined to length. Great for sheds with a requirement for that extra strength and rigidity. Offering an addition timber content of just under 50% when compared to the 19mm boards. There are three flooring options available with the BillyOh Interlocking Windowless Shed Range. Solid sheet option is perfect for low intensity use. Premium Tongue and Groove Boards Treated as standard. Allows you to store heavier items inside your log cabin. Provides a more solid, durable floor. Suitable for high intensity use. Create your own floor for your log cabin to your own specifications with our No Floor option. The log cabin comes with a wooden frame for the floor as standard. Ideal if you are thinking of laying a concrete floor. However, we only recommended this if you are an experienced DIYer. Width 184.1cm 6' 184.1cm 6' 184.1cm 6' 256.3cm 8'5" 184.1cm 6' 184.1cm 6' 256.3cm 8'5" 256.3cm 8'5" 184.1cm 6' 256.3cm 8'5"
Depth 238.8cm 7'10" 326.7cm 10'9" 238.8cm 7'10" 326.7cm 10'9" 385.3cm 12'8" 326.7cm 10'9" 385.3cm 12'8" 326.7cm 10'9" 385.3cm 12'8" 385.3cm 12'8"
Eaves Height (Inc Floor) 162.5cm 5'4" 162.5cm 5'4" 162.5cm 5'4" 161.3cm 5'4" 162.5cm 5'4" 162.5cm 5'4" 161.3cm 5'4" 161.3cm 5'4" 162.5cm 5'4" 161.3cm 5'4"
Ridge Height (Inc Floor) 227.6cm 7'6" 227.6cm 7'6" 227.6cm 7'6" 226.6cm 7'5" 227.6cm 7'6" 227.6cm 7'6" 226.6cm 7'5" 226.6cm 7'5" 227.6cm 7'6" 226.6cm 7'5"
Door Opening Size (w x h) 75cm x 173cm 2'6" x 5'8" 75cm x 173cm 2'6" x 5'8" 75cm x 173cm 2'6" x 5'8" 149cm x 173cm 4'11" x 5'8" 75cm x 173cm 2'6" x 5'8" 75cm x 173cm 2'6" x 5'8" 149cm x 173cm 4'11" x 5'8" 149cm x 173cm 4'11" x 5'8" 75cm x 173cm 2'6" x 5'8" 149cm x 173cm 4'11" x 5'8"
Width (Internal) 152.3cm 5' 152.3cm 5' 152.3cm 5' 210.9cm 6'11" 152.3cm 5' 152.3cm 5' 210.9cm 6'11" 210.9cm 6'11" 152.3cm 5' 210.9cm 6'11"
Depth (Internal) 205.4cm 6'9" 293.3cm 9'7" 205.4cm 6'9" 293.3cm 9'7" 351.9cm 11'7" 293.3cm 9'7" 351.9cm 11'7" 293.3cm 9'7" 351.9cm 11'7" 351.9cm 11'7"